Mimetic Mute is a solo electronic project by Swiss musician Jérome Soudan who also plays with Von Magnet, The Methods, and Column One. Apparently there were two new Mimetic Mute discs released simultaneously, the other being Positive and released on another label. The music runs the gamut of electronic mayhem from techno and drum 'n bass, to industrial, space, and all manner of general freakiness. Among the highlight tracks is "Filter Me", a virtual banquet of electronics that include laid back Dub rhythms and numerous screeches, wails and drones, some spacey and others painfully ear piercing. Some of the electronics simulate human screams, but there are also genuine voices singing a dark choral background which contrasts wildly but intriguingly with the electronic stew. "Moot Point" is more aesthetically pleasing, opening with a spiritual chant that is accompanied by a steady sequenced Tangerine Dream styled line, but also a driving techno beat and other scattered oddball electro noodlings. This has the basis of rave music but dance just doesn't seem to be what Soudan has in mind. 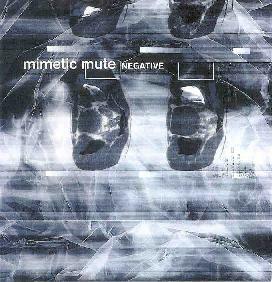 "Negative" has more discernable melody than the other tracks. I especially liked the Middle Eastern strings that play their trippy song while a sampled female voice rambles on in Russian. Like a cross between Yello and Kraftwerk. Both pleasant and insane. The aptly titled "Chilling" is the longest and most atmospheric track on the disc. A journey through a cold dark place, and I imagined drifting in a dead space station. The howls are both frightening and brain splitting, and of course there's a succession of voices and sounds that keep the music continually varied. One of my favorite tracks is "Dubious" which explores radically different territory from the rest of the album. The song starts with ghostly male and female sampled voices backed by spacey electronics. Then it launches into an electro-industrial heavy metal piledriver of a tune, accompanied by frenzied voicings and techno rhythms that make me want to headbang more than toe tap. I had to run fast to keep up with this tune. In summary, there is a LOT happening at once on this disc though it all seems to gel quite nicely. Soudan has fused a number of electronic styles and in the process created of set of tunes that are enjoyably strange and creatively mixed. Good fun. For more information you can email Mimetic Mute at mimetic1@aol.com. Contact via snail mail c/o Jérome Soudan; Boulvard Saint Georges 70; CH-1205; Geneva; Switzerland.